Immunogen: Recombinant β-catenin (N-terminal fragment). 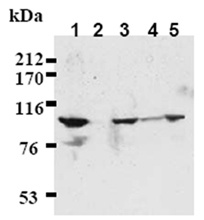 Application Notes: Detects bands of ~97kDa by Western blot. Scientific Background: β-Catenin, a vertebrate homologue of Drosophila armadillo encoded by the CTNNB1 gene, performs two functions in the cell: mediating cell-cell adhesion by association between E-cadherin and the cytoskeleton, and acting as a downstream transcriptional activator of Wnt signaling, a key player in such functions as embryonic development, the induction of cell polarity, and the determination of cell fate. In the absence of Wnt signaling, glycogen synthase kinase-3β (GSK-3β) phosphorylates any free β-catenin at the amino terminus. This results in adenomatous polyposis coli tumor suppressor protein (APC)-mediated β-catenin degradation via the ubiquitin-proteosome pathway. Wnt signaling stabilizes β-catenin by inhibiting the activity of GSK-3β and preventing β-catenin degradation. β-catenin forms complexes with DNA-binding proteins such as T-cell factor (Tcf) and lymphocyte-enhancer factor (Lef), which promote expression of a variety of target genes, including c-myc and cyclin D1. 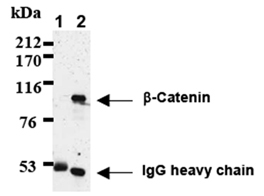 Immunoprecipitation of Rat-1 cells with normal mouse IgG (1) or β-catenin mAb (12F7 (2). After immunoprecipitated with the antibody, immunocomplex was resolved on SDS-PAGE and immunoblotted with β-catenin mAb (12F7). 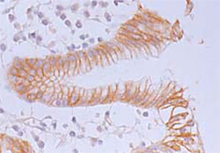 Immunohistochemical detection of gastric epithelium β-catenin on paraffin embedded sections with β-Catenin mAb (12F7). 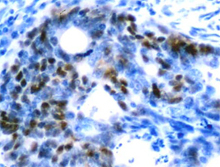 Immunohistochemical detection of colorectal cancer β-catenin on paraffin embedded sections with β-catenin mAb (12F7).